As tempted as I am to bring out a table (which I think is fair) I shan't because I'm too lazy to type the html for a table. Anyhows, let's try to compare 'apples' to 'apples' or in this case, it would be eggs to eggs as well sausages, price and drinks. Eggs are VERY important in one's brunch and I'm only a scrambled or poached eggs kind of girl so that's what we're going to compare first. For poached eggs - Prive, Spruce, Parco and Barossa passed the test. Their eggs were not sour from the added vinegar in the water and they didn't over cook the yolk. However, Parco Caffe's one was the most sour and it's most definitely NOT from the balsamic vinegar dressing at the side. 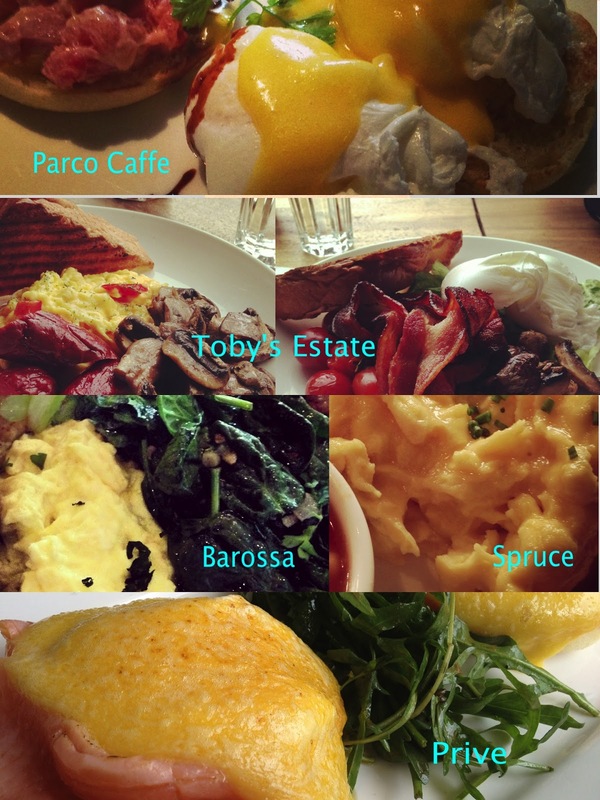 For scrambled eggs - Toby's and Barossa had the best ones. Spruce's scrambled eggs were well seasoned but overcooked. That said, Prive had the best smoked salmon. It was not too salty and they were rather generous with the serving. Too bad the Hollandaise sauce is too oily and sometimes, overpowers the salmon. Special mention - I liked that Parco went off the traditional route and had salmon tartare and avocado! Toby's had the best sauteed mushrooms which they drizzle truffle oil with. Best sausages...it's a tie between Toby's and Spruce. The chorizo served at Toby's is savoury and packs that smoky spice while Spruce's cumberland was hearty and filled with solid meat. I love them all! Hahaha...well, go to Prive once just to eat next to the sea and if you want to feel like you're hob nobbing with the wealthy; Spruce and Toby's for that modern but yet industrial feel; Parco for that slightly whimisical (if you're in the small 'private' room) feel or sleek modern in their main dining hall or Barossa for that pub feel. Most family friendly would be Parco Caffe as they have a large play area for children and when I went there the last time, they had a blown up air castle for children to bounce around in. Barossa. For S$25++ (if I remember right), you get sooo much food! And a drink. Great thing about the branch at Holland Village is that it's relatively quiet on a Sunday afternoon so you can lounge around and if you're up to it, order a beer after brunch. Only problem after is finding a comfy spot to snooze. *Drumroll* And the winner is....BAROSSA!! They did everything right! 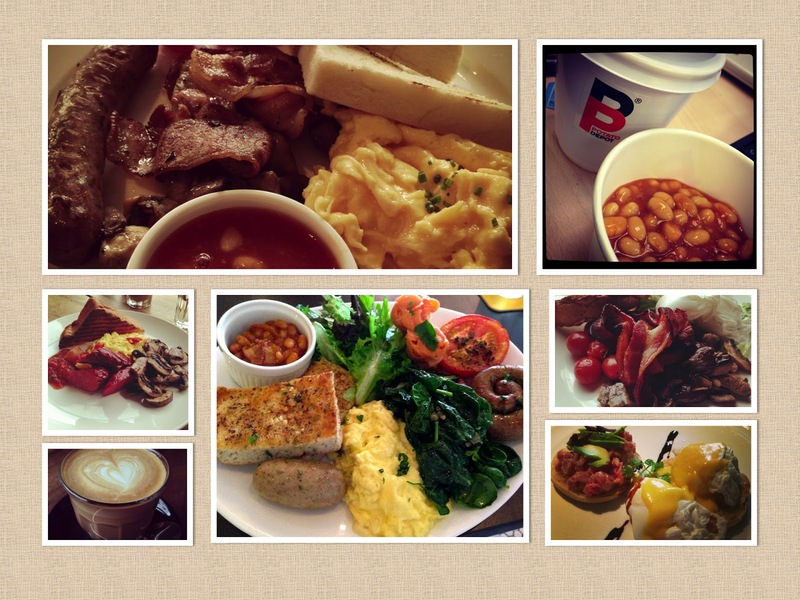 The price, the done-ness of the eggs and the variety on the plate. Only sad thing is that they don't do pancakes. For that...go to Prive!